Phoenix-based Knight-Swift said it earned $162.9 million, or 93 cents a share, in the three months ended Dec. 31, compared with $94 million, or 52 cents a share, in the same period a year ago. Revenue climbed 2.6% to $1.39 billion in the fourth quarter of 2018 from $1.36 billion in 2017. The company’s truckload business, which provides dry van, refrigerated, dedicated, drayage, flatbed and cross-border transportation services, operated at an 80.9 adjusted operating ratio in the fourth quarter, compared with 85.8 in the same period a year ago. The operating ratio is calculated by dividing operating expenses by revenue and is a basic measure of efficiency in trucking. Leading the way in profit improvement was Swift Truckload, which posted operating income of $90.8 million in the fourth quarter of 2018, a 35.6% gain over $67 million the same period in 2017. Revenue fell 13.2% to $377.4 million from $434.7 million. Knight Trucking generated adjusted operating income of $57.2 million in the fourth quarter of 2018, a gain of 44.4% from $39.6 million a year ago. Revenue increased 21% to $260.8 million from $215.4 million. Swift Dedicated posted operating income of $24.2 million in the fourth quarter, up 24.6% from $19.5 million a year ago. Revenue rose 3.6% to $149.9 million from $144.6 million. Swift Refrigerated generated operating income of $13.1 million in the fourth quarter of 2018, a slight dip from $13.2 million a year ago. Revenue dropped 2.6% to $181.8 million from $186.6 million. Knight-Swift said the total number of tractors in its truck fleet has stabilized and averaged 18,828 during the fourth quarter. Company officials said in a statement that strong demand in the fourth quarter supported increases in contract and noncontract rates and that the company expects further increases in 2019, although at a slower pace than in 2018. “We continue to see opportunities in our trucking segments to improve yields, increase revenue per tractor and enhance our ability to source and retain drivers without compromising our commitment to improve safety,” the company said. 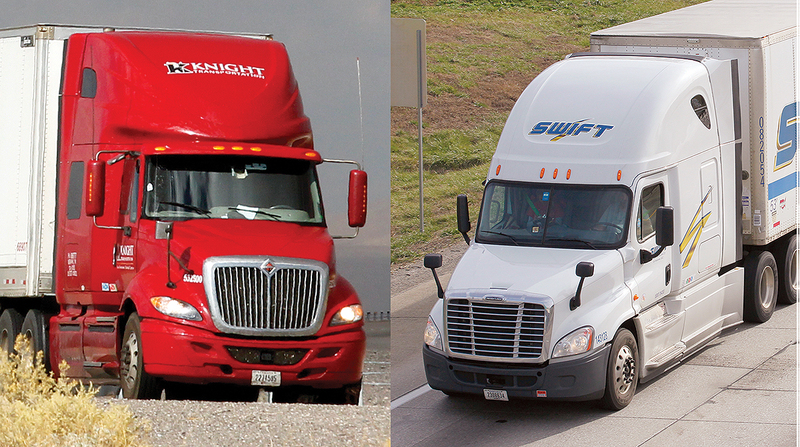 Knight Logistics generated adjusted operating income of $9 million in the fourth quarter of 2018, more than double the $3.9 million a year ago. Gross revenue surged 47.5% to $97.2 million from $65.9 million. Swift Intermodal saw operating income of $12.7 million in the fourth quarter of 2018, compared with $4.6 million a year ago. Revenue jumped 21.4% to $111.5 million from $91.9 million. Knight-Swift ranks No. 5 on the Transport Topics Top 100 list of largest for-hire carriers in North America and No. 1 on the TT list of largest for-hire carriers in the truckload/dedicated sector.